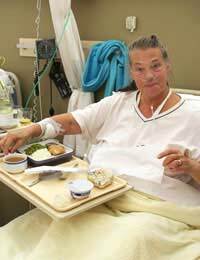 Hospital food, in a similar fashion to school dinners, sometimes gets a unfair bad ‘rap’. However, this is usually from people who have never been in hospital for quite some time, if at all, and the standard of food is usually very high. Whether your experience of the food is good or bad often depends on your own input into the kind of meals you want. With so many patients, a hospital cannot obviously cater for every individual’s own specific preferences but there is a lot more choice these days and all hospitals will have specialist catering companies who will endeavour to vary the menus each day as well as catering for specialist dietary needs. Here are a few things you can expect when it comes to hospital food. Most hospitals will bring round a menu card each day so that you can choose what you want off the menu for the following day. You’ll get three meals a day, a breakfast at around 8am, lunch around midday and dinner about 5pm. Breakfast will usually consist of a glass of fruit juice, a cup of tea or coffee and a choice of cereals and some toast with jam or marmalade or perhaps a piece of fruit. For lunch, you’ll often have the choice between some kind of hot food or alternatively a sandwich and, perhaps, a bowl of soup and maybe something sweet like a yoghurt or a piece of fruit. Then you’ll usually be able to choose an evening meal from a choice of about 3 or 4 different meals each evening, plus a choice of dessert. Most hospitals will also give you the option of having a mid-morning and afternoon cup of tea or coffee with, perhaps, a biscuit or cake to accompany it. Hospital menus will also cater for those who have special dietary needs so whether you need a vegetarian, diabetic or gluten free meal etc, you’ll be able to tick that box on the menu each day and you should be given at least two choices in each dietary category. In addition, hospitals will often cater for those who need to eat food that is suitable for any religious or cultural requirements. Hospital catering companies are becoming well aware that not all people eat a set amount of meals each day at a particular time of the day so many of them have introduced a ‘snack box’ which you can tick on the menu card, if that’s your preferred way of eating. Therefore, in order to get the kind of food you want, it’s important to read through the menu card each day and tick the appropriate boxes as you can’t assume that the staff will know what you want. And, if you’re not happy with the food, you should tell a member of staff and if it’s possible, they will go out of their way to try and help you get the food you want. Some people will complain that portion sizes are too big or too small but some hospital menus now include a portion size box which you can tick to state whether you want a smaller or larger portion but if it doesn’t and if you feel you’re still hungry, tell a member of staff. Depending on your individual medical issues and what you may or may not be allowed to eat, two further options you might have is to walk down to the hospital cafeteria and purchase food from there or maybe you can buy something from the hospital shop. Many hospital shops are like mini-supermarkets these days where they’ll have often have a plentiful supply of hot and cold snacks, sandwiches, crisps and sweets etc. And, providing you’re permitted to do so, you could always ask visitors to bring in food or snacks for you. A good idea is to ask the hospital to send you a typical menu card before you go into hospital so you can get an idea what kind of food is available and what choices you have before you actually arrive.